The adaptation of classic video games to next generation 3D is a trend that can benefit some old titles that haven't been seen for a little while. Bionic Commando came back in fine form as easily one of the best remakes to ever grace consoles. New Super Mario Brothers for the Wii proved that you can take an old dog and still teach it some new tricks. Of course, when many people think of classic video games they think of animal mascots, and one of the oldest is a little green frog. Unfortunately for Frogger, his latest outing makes me think he should be run over by a car and stay dead for good. Sorry, buddy. 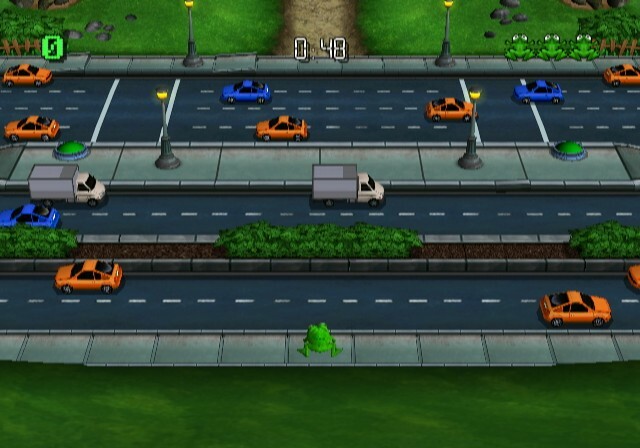 If you've played the old Frogger then you know what Arcade mode is. You dodge cars, pick up some power-ups, and make your way across the logs. I don't care what anyone says, it still doesn't make any sense that you control a frog that can't swim. Thankfully, there is an indestructible power-up you can get which allows you to survive car hits and drowning. It doesn't make up for how much of a failed amphibian this little guy is, but it is a step in the right direction. Everything else revolves around steps in the wrong direction. The other single-player modes are just variations on the same thing, on the same four levels available in the arcade mode. Frustration, agitation, and absolute hatred for the damn frog will come at you from every angle. Using the freeze power up will stop the cars in their tracks, but even lightly brushing into them kills you. This damn frog isn't just a failure at being a frog, he is a failure at life preservation. The multi-player modes have a little more promise and depth, but even then you'll be sent into murderous rages. I played the four multi-player modes with my wife, and even the seasoned gamer that she is couldn't keep herself from regressing to an almost nostaligic childlike state. Unfortunately, it was the same youthful state that I was in, which includes the urge to sob as you throw your controller on the floor and stomp on it. In fact, after the last round we played she yelled "I hope whoever made this game gets diarrhea." Harsh, yes, but it isn't completely unjustified. Graphically, this game is about as polished as an early PS1 title. I don't expect Pixar quality output from the Wii, but I have seen some sharp graphics on the console. Worse than that is the sound. They kept a few old sound effects intact, but my problem isn't with the classic bloops and bleeps. The pablum, boring, generic music used in the game is terrible. Through multiple levels and modes, you'll hear the same one song, over and over again. If there are any others in the game, I never heard or noticed them. They used so many of the old effects that I was hoping to hear the famous level intro music before you start hopping. Even the song "Frogger" from Bad Religion has the damn intro in it, and that was back when they were a poor punk band, around the time the first game came out! There are plenty of classic game franchises that have frustrating difficulty levels, but once you get past those hair-pulling moments you get the feeling of accomplishment. Konami's Contra series comes to mind, but this is no Contra. As a downloadable WiiWare title, I guess you could do worse, but if you have some Wii points to spend, you're better off with some Virtual Console games or some of those other more worthy indie titles. 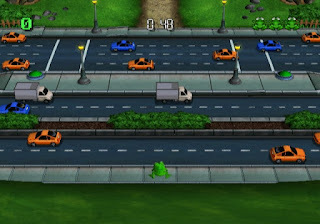 I wish I could say that Frogger Returns is a worthwhile entry in frogs history, but instead it just proves that it ain't easy being green.